On a wintry January day in Fredericton, N.B., Paul, Bev and their son Ryan were returning home after attending the Mike Fitz Memorial basketball games at the Currie Centre. To cap off a fun-filled day, the family ordered a take-out pizza and sat down together at home to enjoy their meal – along with some hot pickled peppers on the side. 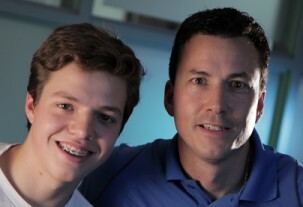 Ryan had just completed the ACT High School CPR and Defibrillator Program – he knew what he had to do. “He didn’t need any prompting from me,” says Bev. “He asked Paul if he was choking, told me to call 9-1-1 and started those thrusts.” Ryan administered three or four abdominal thrusts until Paul gasped for air, then ensured the obstruction had fully cleared itself. In fact, Ryan was among the first wave of students in the Atlantic Provinces to have received training through the ACT High School CPR and Defibrillator Program. It was set up at Leo Hayes High School in 2012, thanks to the generous community-level support that enabled the donation of mannequins, teacher training and curriculum resources. The lead community partner in Fredericton is the Fredericton Community Foundation. ACT’s national health partners supporting the program in Fredericton and throughout Canada are: AstraZeneca Canada, Pfizer Canada and Sanofi. They provide ACT’s sustaining funding and are committed to the Foundation’s national goal of promoting health and empowering Canadians to save lives. The Advanced Coronary Treatment (ACT) Foundation is an award-winning, national charitable organization dedicated to establishing CPR and AED training in high schools across Canada. ACT raises funds to donate mannequins and teacher training to schools, and guides schools in program set-up and long-term sustainability. Over 2.6 million youth have been trained in CPR by their teachers through this lifesaving program to date.